With summer around the corner, most of us picture a perfect day off or an afternoon after work as one spent outside. Spending time in the open air is enjoyable and rewarding until you get hungry. After that happens, it is better to quickly grab a bite before someone gets hurt (I am speaking from experience here). Thankfully, we have a variety of places that offer take-away food which will definitely save the day. From sweets, through food trucks, to one of a kind spots – street food in Wroclaw is what you should go for when the weather is nice and you want to give yourself a break from booking tables and going through the “restaurant procedure”. Stara Paczkarnia offers freshly fried Polish doughnuts. Every day, you can choose from a variety of fillings and just get one (or 3) doughnut to go. To be fair, the ones they make are sizeable, so one should be enough to restore your energy and help you do some more sightseeing. You may face two challenges though: a line of people who had the same idea for their snack, and too wide a selection of fillings. But as they say, ain’t no mountain high enough – you can do it. 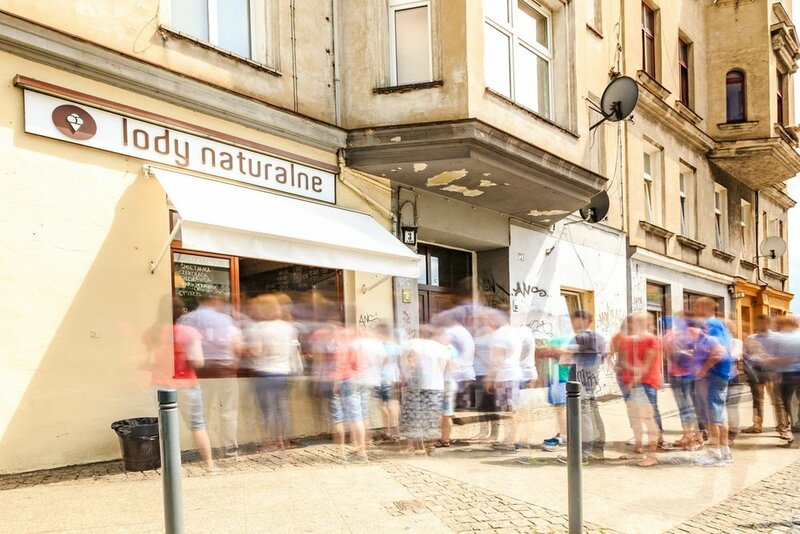 The first ice cream shop in Wroclaw which started making “natural” ice cream. They were one of the precursors of the ice-cream revolution in the city, and since 2014, they have not lost popularity. To get ice-cream there, you may have to reserve some time, as there tend to be very long lines, but if you happen to need a break from walking, give it a shot. If you have company, you can split and in the meantime, they may stand in the line next door to get some other delicacies. A real phenomenon – probably the only bakery in the city where you need to stand in line for at least 20 minutes to get your favorite bread and buns. I am a person who values her time more than other things, but all they bake here is absolutely worth waiting for. If you are staying at a hotel, you may skip buying the entire loaf of bread, but you may definitely go for something smaller and easy to carry around with you. I highly recommend: a blueberry bun (jagodzianka), an apple sweet roll and a cottage cheese sweet roll (koperta z serem). They also offer savory pastries, such as rolls with onion, cheese and caraway with coarse-grain salt (solanka). The idea behind Frytki + sos could not be simpler – French fries + some interesting dip and there you go. Based on that, we may say that the simpler one gets, the more genius they turn out to be. The fries are delicious – hot, thick, and crispy. The dips, in turn, are value added. They are based on original recipes and they may differ throughout the week. There are also special dips prepared for vegans. It does not matter if it is lunch time, or if it is 2 AM and you suddenly find yourself craving fries. The fries served in Frytki + sos will solve all your problems, and cater for all your needs. One of the “oldest” street food crews in Wroclaw. They have a food truck and a spot near the market square and the whole city knows their wursts. You may get a classic set with a bun and a wurst (or 2), or you may go in the Czech direction and order fried cheese instead. One thing is certain – you will love it. And the best thing is that you will get it quickly, so there will still be plenty of time to visit the city. They are said to be one of the best pizza food trucks and spots in the city. In Legnicka, there is only a food truck, but thanks to a genuine pizza oven which they have, you will never call their pizza fast food. The ingredients they use are top quality, the dough is perfect and the combination of ingredients pretty innovative. If you want to get a taste of Poland, do not shy away from Rusalka. This pizza is topped with the one and only filling which is normally used in Russian dumplings (which are one of the must-eats when in Poland), i.e. farmer’s cheese, potatoes and onions, plus white sausage, bacon, cream sauce and spring onions. This pizza is to die for. I guarantee you have never tasted anything like that before. I am not sure what is better – the pizza they make or the beer that the next door multitap, Marynka Piwo i Aperitivo, serves. Fortunately, such dilemmas never need to be resolved. You can simply go there, give both a chance and see if you will manage to choose the winner. Happy Little Truck is another master pizza food truck that serves pizza you cannot get enough of. They use original Italian ingredients and dough that ferments for 24 hours. My personal favorite is Chorizo on top of which they add some honey. The spiciness of the sausage combined with the sweetness of the honey is what will make your day brighter. And if you find yourself thirsty afterwards, fear not, as Marynka’s beers will help you get through it. Delicious Mexican food, genuine taste, and original names on the menu. Get one of their Big A** Burritos and you will not worry about being hungry for a long time. They started with a food truck, last fall they opened a restaurant in the Four Denominations District, and soon they are about to open a new breakfast spot near the market square. Obviously, everyone wants more of what they got. Polish food is my absolute favorite, but when I am served such good Mexican food, I start thinking I may have been Mexican in some other life. Absolutely worth trying. If you like natural ingredients and you support sustainability and organic farming, you should visit the weekly foodie market. Apart from the possibility to buy organic produce, such as cheese, meat, honey, fruit, vegetables, bread, etc., you can choose from a variety of dishes served at different stands. There are various things on offer every week, but the most popular ones are pancakes, herring, Ukrainian dishes, coffee and natural ice-cream. It is a great place to spend your Sunday morning at. Apart from the permanent spots, you will see a lot of food trucks around the city located along the riverside, near the Centennial Hall, and at the city beaches. You can be sure that you will find a nice place to eat at even if you move away from the very center. Also, if you are lucky enough to be in Wroclaw when a food truck festival takes place, take some time to explore the variety there. Nowadays, food trucks are trying to be as innovative as possible to be able to fully compete with traditional restaurants, so you can be confident they want to impress you and serve you something you will remember for a long time.